We always love hearing from all of our guests! Guest reviews not only warm the hearts of all our employees, but more importantly, it helps us improve the quality of our service. 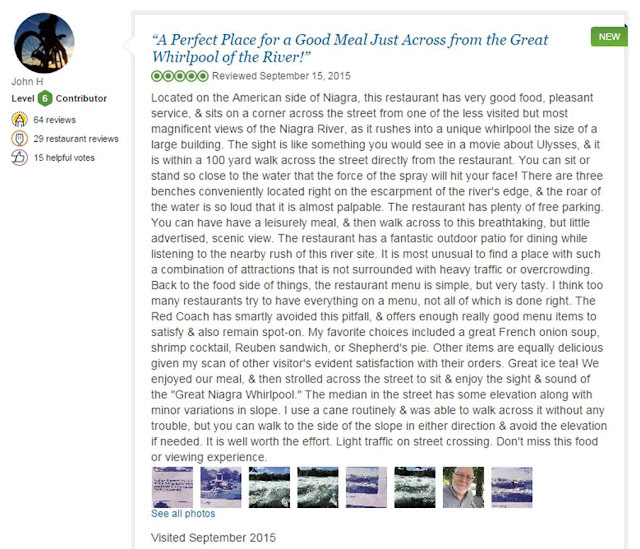 Today, we would like to share three recent reviews we got from our guests at the restaurant. Our three valued guests all talked about location, service, and the dishes that stood out for them! These three are just few of the many things we take pride in our establishment. The Red Coach Inn is just 500 yards away from the falls, it'll only take you 5-6 minutes to walk and view the falls. From our Rapids Room, a windowed room in the restaurant, and the patio--you have the view of the upper rapids of the river. Seating outside, you can hear the roar of the water! With service, the whole staff dedicates themselves to providing the best quality to all our guests. We all strive to make sure that we meet, if not exceed, our guests' expectations. Also, with our excellent service comes great food! Our chefs have come up with a variety of choices for our regular menu, and also offer different specials every day. We invite everyone to try our restaurant! Read the guest reviews above for their meal suggestions.. just a few of the many options you have at the restaurant! Again, we appreciate all of our guests' kind words. We love hearing from all of you, so keep 'em coming!